Laminated enlarged reproduction of newspaper cutting. 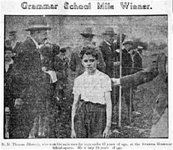 Depicting Dylan Thomas age 12, caption reads ‘Grammar school mile winner’. The text reads: “D.M. Thomas (Mansel), who won the mile race for boys, under 15 years of age, at the Swansea Grammar School Sports. He is only 12 years of age”. 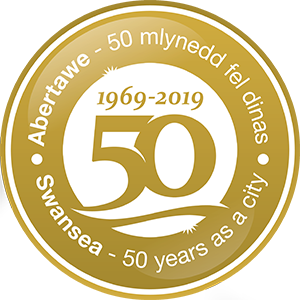 The original newspaper article (if required is probably available from the National Reference Library in Alexandra Road, Swansea). This shows that, contrary to popular opinion, Dylan was fit as a youth. He was so proud of winning the race that he kept the newspaper article throughout his life – it was found in his wallet when he died.